The Croatians sign left winger to cover the injured Štrlek. After winning a silver medal at the World Championship, the Croatian international Mateo Hrvatin signed for Zagreb Croatia osiguranje. Though the left winger was quite new to the national team, Hrvatin showed an impressive performance at the World Championship. He played nine games and scored 25 goals at the tournament. The regular left wing of Zagreb, Manuel Štrlek, is still recovering from a knee injury (cruciate ligament), so Hrvatin will be a great help to Ljubo Vukić in the left wing position. 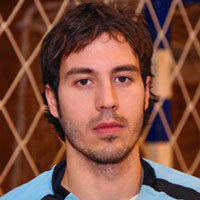 The 28-year old arrives from another Croatian side, Zamet Rijeka. He signs for Zagreb until the end of 2009/10 season.